Most people will sign their home insurance policy, put them away and start living in their home feeling safe they are protected from danger. 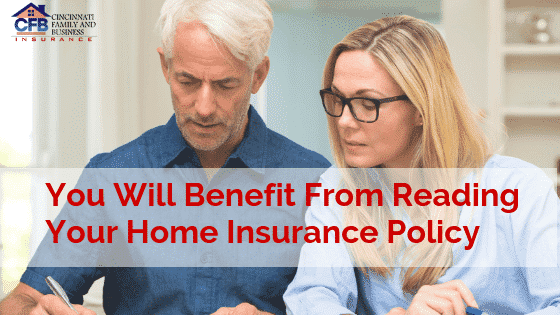 It is important for a homeowner to know exactly what is in their policy. If they have made improvements to their home, the value of their property has increased or any similar thing has occurred that could change the coverage needed for a property, it could result in a homeowner to being underinsured. Insurance companies estimate over 59 percent of homes in the United States are underinsured. Each policy provides details of what is covered as well as what is excluded. It is important to look at the declaration page of an insurance policy to make certain all the personal information it contains is correct. Check to make sure the coverage levels listed are correct and make certain any riders previously added are listed. This section will help a homeowner understand the details of the property they have that is covered. This part is divided into sections because each category will have a different coverage limit based on losses. Dwelling. This covers a home used as a primary residence and any structures that are attached to it. This could be a deck, attached garage and more. Personal Property. This will provide descriptions and limits for a homeowner’s personal belongings. This protection extends to any location in the world for covered items. Other people’s personal property may be covered when it is in a policyholder’s home. It could also cover the personal property of an employee or guest and more. Loss Of Use. This describes the expense involved with repairing or rebuilding the property when it is damaged. This includes payment if a homeowner must stay in another place while their house is being repaired or rebuilt. A certain amount of money could also be provided for living expenses. If a property owner lives in a multi-unit building, and a unit in this building is damaged, the owner could be reimbursed for the fair market rental value of the damaged unit. This section will cover all the costs associated with damage to people and property not listed in the policy. This could cover someone accidentally slipping and falling on a homeowner’s property and more. In this part of the policy, the insurance company states the circumstances in which it will defend the policyholder against claims as well as pay the claims if the policyholder is found at fault for a person’s injuries on their property. This covers medical payments to others. It will cover in detail the limits and types of expenses the insurance company will cover for people not covered by the policy. This could involve such things as surgical expenses, ambulance, hospital stays and more. It will list payments to individuals even if the insured is not at fault for an accident involving their property. If a neighbor breaks a leg during a party at a policyholder’s home, this would provide reimbursement for medical expenses up to the limit stated in the policy. It’s also important for a policyholder to review any and all riders they have attached to their policy. They may have some additional items they want to add or some they may want to remove. Insurance riders can cover many different things. Underground Service Line. All homes depend on many different underground service lines. This includes everything from water, heat, cable, internet and more. A homeowner is responsible for maintaining them. This will provide coverage should problems occur with underground service lines. Sewer and Drain Back Ups. A situation could occur that provides a huge coverage gap for many homeowners. This will provide coverage for repairing or replacing a homeowner’s basement if the damage is caused by a sewer or drain backup. Identity Theft Protection. Cybersecurity experts estimate in the United States someone becomes the victim of identity theft every three seconds. This will make it possible for a homeowner to get professional help in restoring their identity. This will involve preparing a case file for creditors and credit bureaus. All necessary information will be provided to law enforcement and more. High-Value Items. Collectibles, jewelry, artwork are often worth more than money to some homeowners. This will cover a high-value item getting stolen or damaged. This will provide compensation. It is always important to know what is in your home’s insurance policy. An occasional review and update are important. A homeowner’s life never stays the same after initially purchasing their property. They benefit when their home insurance reflects all those changes.